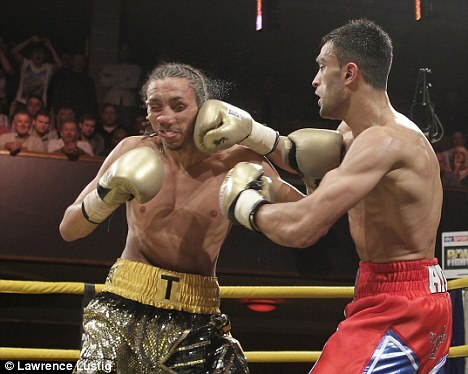 Adil Anwar is gunning for a British title shot after defeating Tyrone Nurse in the final of the Prizefighter Light Welterweights II at Wolverhampton’s Civic Hall. Leeds' Anwar went into the competition unbeaten and maintained his fine record with a convincing win over Nurse, who suffered defeat for the first time in his professional career. Anwar used his jab to keep Nurse at bay and rocked the 22 year-old with a late flurry to secure a unanimous decision that he believes pushes him into title contention, with Brit king Ashley Theophane the chief target. 'Tyrone is a good operator but I was a lot faster and a lot slicker,' said Anwar. 'The jab was the secret tonight and now I want to test myself against the bigger names. I won the English Welterweight title under the radar and I've been avoided. Now I have won Prizefighter live on Sky Sports – without getting out of second gear – I've shown I bring a lot to the table. 'This was my first televised performance and that has been frustrating for me as I think that I've got the lot, and that people will want to watch me. I bought a lot of great fans down with me but at the end, everyone was supporting me because I'm entertaining, and that's what it's all about. 'I wanted to shine and I think I have. I'm a risk taker and tonight could've been seen as a risk, but I was hugely confident of winning this and I think this will open big doors for me now. Kell Brook and Matthew Hatton performed the live draw and the 24 year-old was picked to face Barry Morrison in the third quarter-final of the night and the Leeds man started as he meant to go on with his slick work dominating the former British champion. Anwar then met a fresh John Watson in the second semi-final, after the Liverpudlian took just 100 seconds to defeat local favourite Dean Harrison, with Watson flooring the Wolverhampton fighter then unleashing a barrage of punches that forced referee John Keane to step in – Harrison announced his intention to hang up his gloves shortly after. Although Watson had saved some energy with the early stoppage, Anwar won every round with the judges in their semi-final, and was beginning to enjoy himself as he found Watson’s style to his liking and mixed great movement with some flashy shots. Nurse’s journey to the final was a trickier affair having drawn one of the favourites in Dale Miles in the second quarter-final. Their fight moved into what looked like a winner-takes-all final round but Miles had already been cut above the right eye and a clash of heads in the final stanza opened it up again, forcing a disappointing end for Miles in what was building into a cracking final three minutes. Nurse then faced the experienced Young Mutley in the first semi-final of the night after Mutley had edged a cagey opening bout with Mark Lloyd on a split decision. Nurse was impressive in withstanding a late rally from Mutley, with the youngster using his superior speed and movement to take the opening rounds to reach the final.